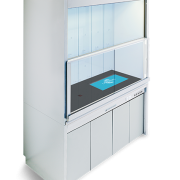 Blau line is based on several years of experience on the construction of laboratories with different requirements. It is also based on high patterns of demand, allowing the settlement of the different needs of a modern laboratory. All workbenches and support structures are designed in order to ensure a high robustness and durability, both regarding to the coefficients of structural calculation, as well as the selection of materials and finishing. Preserving its modular concept in O and C structures, Blau 2.0 provides a unique experience of ergonomics, strength and flexibility.